Essay for Gary Soto's "Seventh Grade"
This is a fun essay that goes along with the short story "Seventh Grade" by Gary Soto.. I'd have the students write the first paragraph on the first or second day of school. I would collect them and give the paragraphs back after reading the short story. 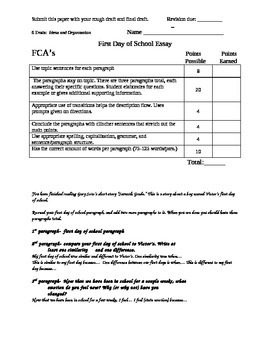 It's a quick and easy warm up to the school year writing assignments. It also helps practice comparison writing and transition words. I have it on two pages to save paper. I'd print it back to back and cut the page in half.